What a great week I had with my Dad! Jack got into Cleveland a day or so ahead of our New Albion Ale can release party on October 5th, and I had the opportunity to take him to the new Platform production facility, which was once the old Cleveland Leisy Brewing Company. 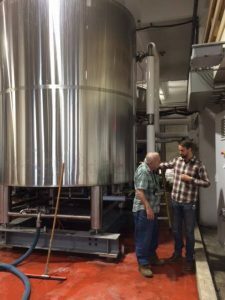 He enjoyed the tour given by owner Paul Benner, and seeing how much our brewing partners have grown since the last time he was in town for our original partnership kickoff party back in 2014. The next night was the can release party, and it was all about family, friends, beer and fun! Jack was pleased that his brother Tom came in for it from Chicago. 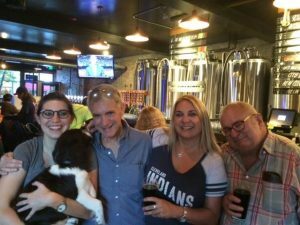 It was Tom’s first visit to Cleveland, and he was very impressed with the craft beer scene in our fair city. 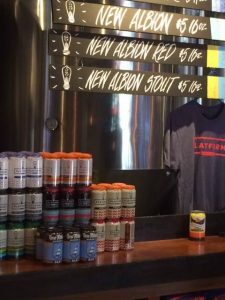 The party got rolling around 5 p.m., and we had the chance to say hello to many New Albion fans who stopped in for a taste and to take a six-pack home–Jack and I were happy to see everyone loving the latest incarnation of his standard bearer recipe. He enjoyed chatting with everyone and taking photos with everyone who asked. One of my favorite pictures of the evening included my daughter Ali, my Uncle Tom, my new puppy Porter, and of course Jack himself! HOMAGE was also on hand to take orders for the New Albion t-shirts–those are just flying off the proverbial shelf! (You can get yours now for just $32.) 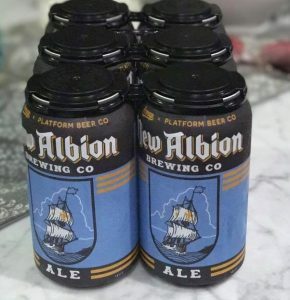 Meanwhile, I hope if you’re in Ohio, you’ll ask your Platform Beer retailer for a six pack of New Albion Ale–it’s delicious and it’s selling out quickly! 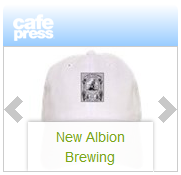 The timing of the release was perfect as October 8th was the 41st anniversary of the incorporation of New Albion Brewing Company. Look for me around Cleveland in the coming week–it’s Cleveland Beer Week— and I’d love to know what you think about the new brew! Cheers! Tagged as: Cleveland Beer Week, Homage, Jack McAuliffe, Napa Smith Brewing, New Albion Brewing, Platform Beer Co. Previous post: New Albion Ale to be Released in Cans! Plus HOMAGE tee!